Time: 6h40min (walking time without stops). 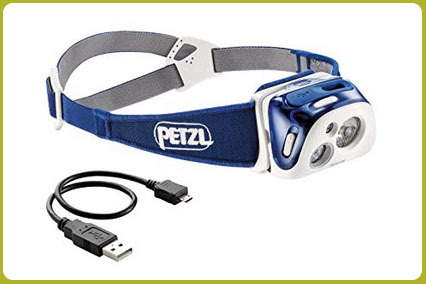 Difficulty: none, except for the distance and elevation difference. Water: There will be no problem finding water on the way to Setcases. 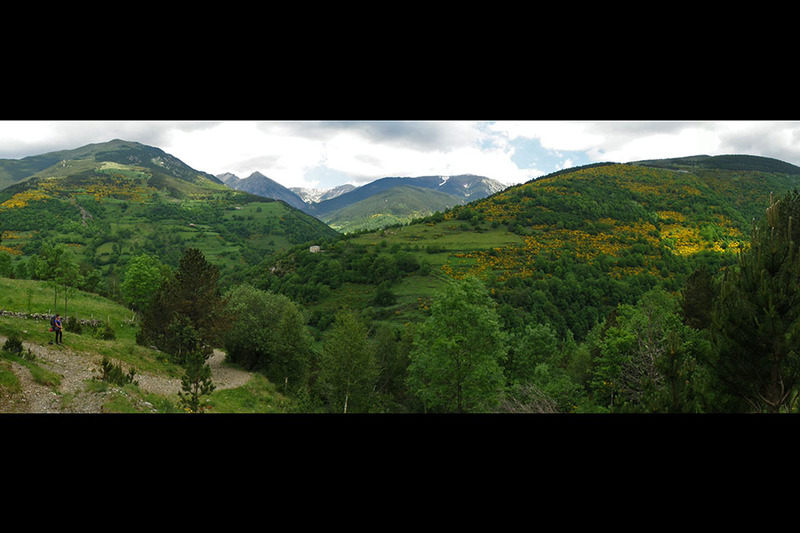 Between Setcases and Molló you will find the odd stream of dubious quality. The best strategy will be to fill up at the start of this stage. 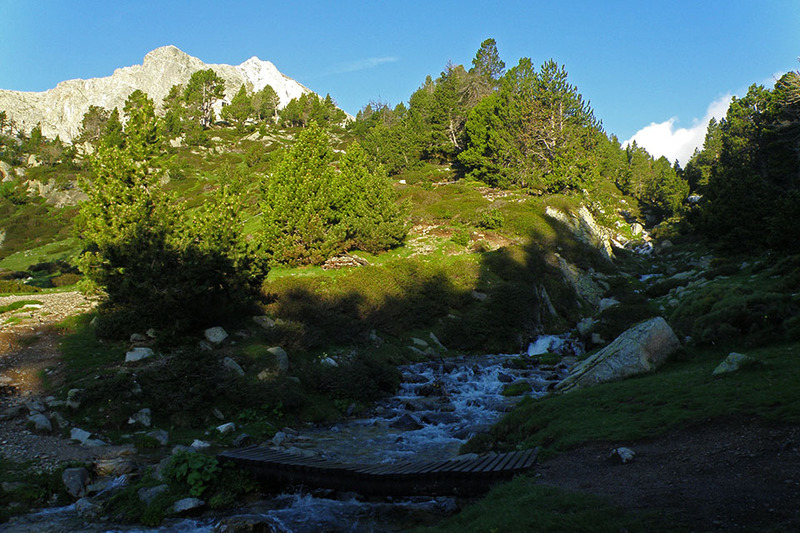 (0h00min; 0 kms) Refugio de Ulldeter (2.220m). 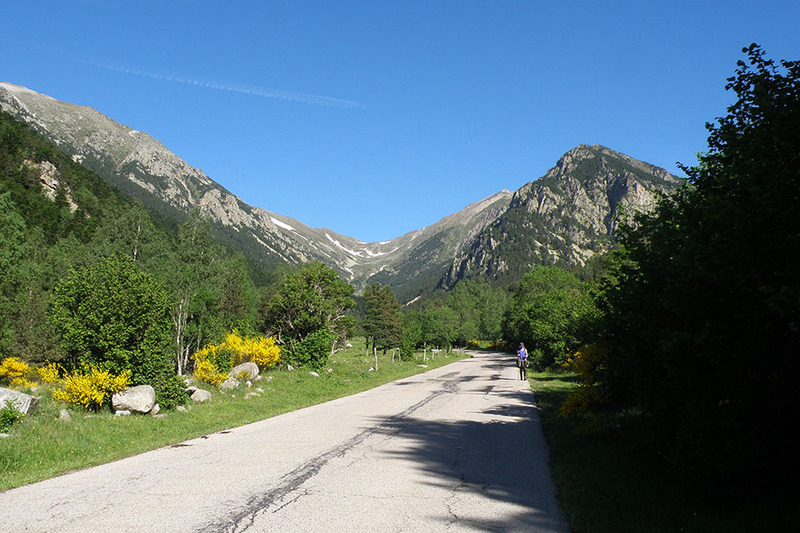 You head down the access path to the refuge as far as a hairpin bend (small car park) in the road, that goes up to the Vallter 2000 ski resort. (0h20min; 0,7 kms) Road (2.085m). You avoid the road by taking a number of shortcuts until you reach the last bend, where you follow it as far as the lower car park. This second car park was built in 2004 and modified the old GR11 route. 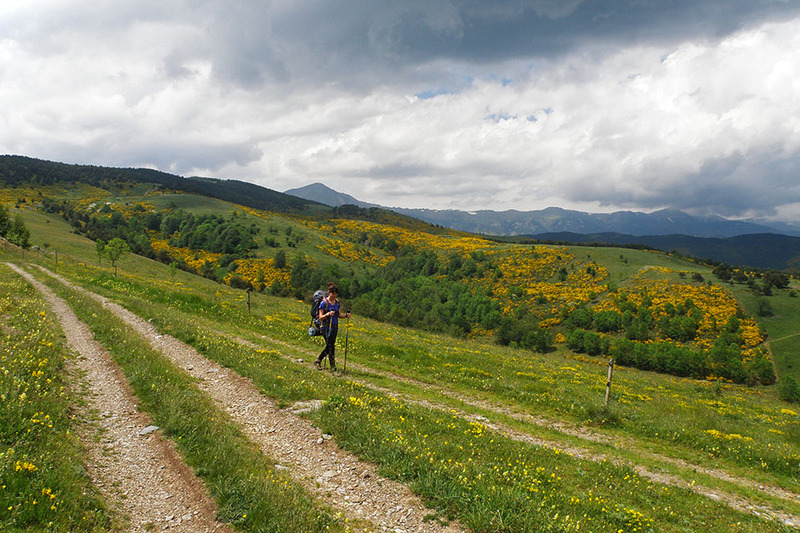 On most maps you will find that this place appears correctly as Pla dels Hospitalets, but at Pla de la Molina, you will see a panel that wrongly gives this spot as its location. Cross it in search of the yellow and white markings that lead you down to a wide path that runs along the river Ter, "accompanied" by a line of high-tension pylons. It is not long before the red and white markings reappear. Further down, after 20mins, you pass the Font del Saüc drinking fountain. 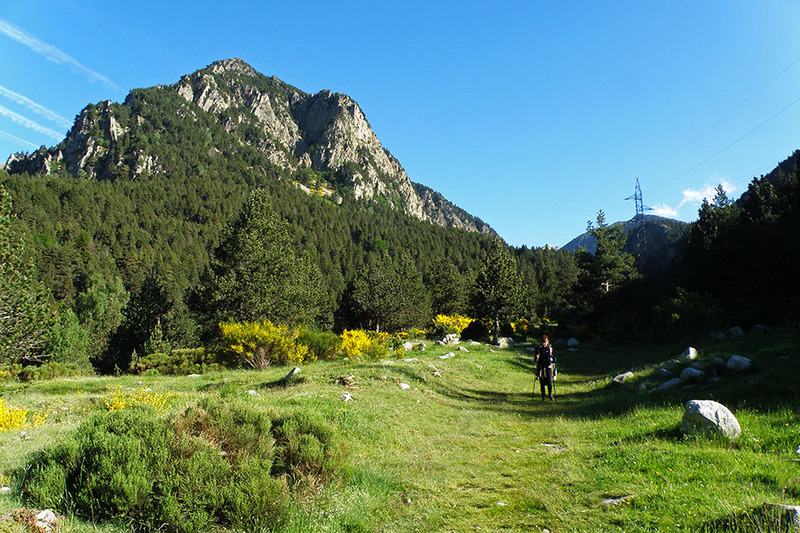 (1h30min; 4,0 kms) Pla de la Molina (1.595m). 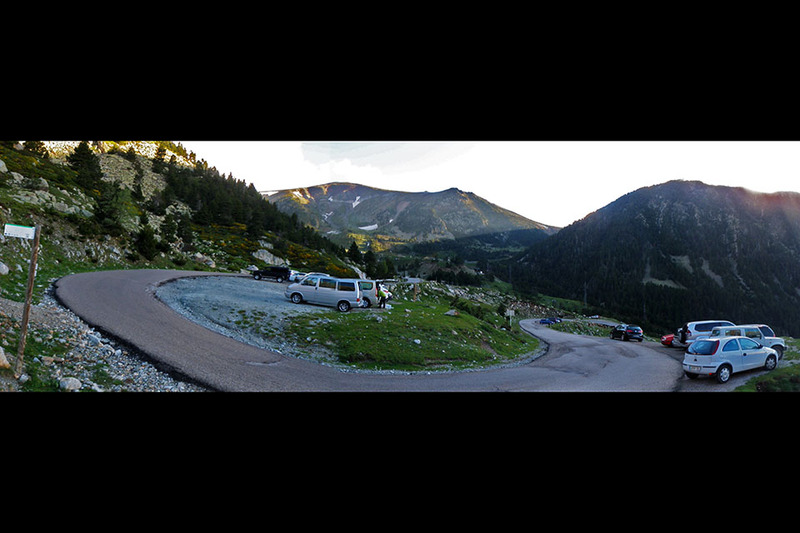 You come back to the road on a hairpin bend where there are usually cars parked. You will see a set of information panels, one of which indicates that the GR11 heads up the road to the resort for 200m, then takes a path on the right. 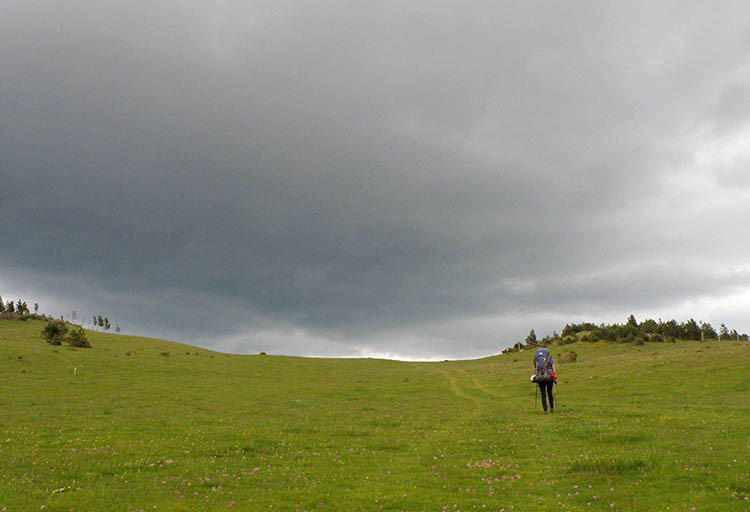 No markings can be seen, and you follow the road downhill. After 20 minutes you pass a drinking fountain on the left and 2.2kms later, just as you pass a bridge before reaching Setcases, there is another one (Font del Pont Nou). A few metres further ahead, at the junction where you take the turning that indicates the way to the centre of Setcases, you pass another drinking fountain. 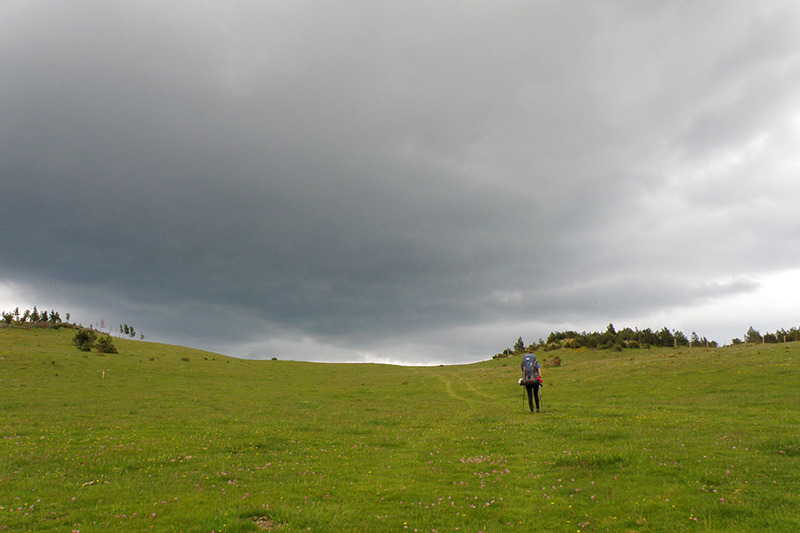 (4h25min; 12,2 kms) Collado de Lliens (1.867m). 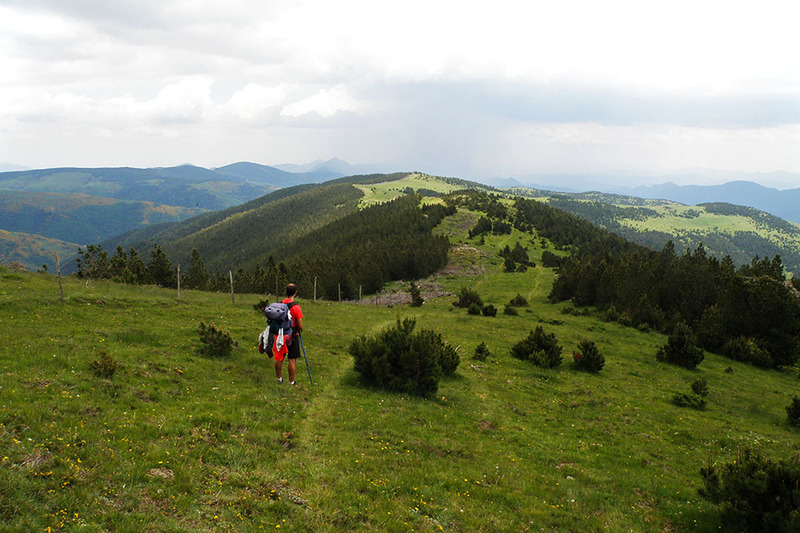 You cross the barbed-wire fence and walk along the hillside, past pine trees, below the Puig Sistra peak (1,989m). The path comes to the border ridge, where it follows it down, passing La Fembra Morta col (1,726m) and coming out into a more open area below Puig Moscós peak (1,739m), where you pass a stream -the area is a bit boggy- and you reach a fence running in a north-south direction. 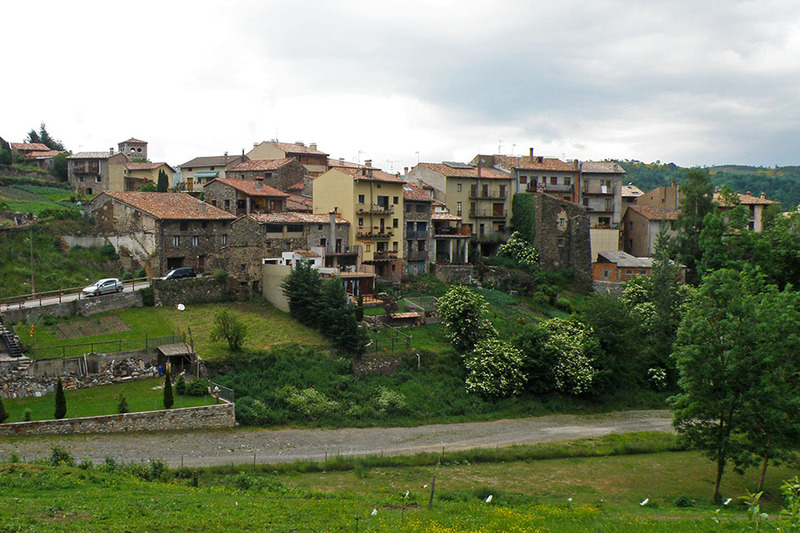 (5h25min; 15,8 kms) Alambrada (1.660m). Cross it and follow it for about 200m, until the GR11 peels away and drops down to the left, crossing an area dotted with trees. 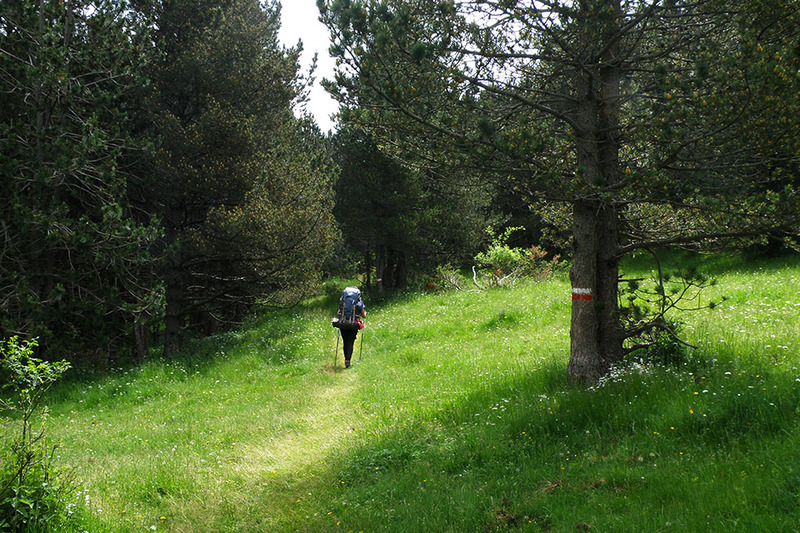 At the end of the woods you come to a path (right), which crosses a small stream. In the distance you can make out Can Pletis. (6h05min; 18,1 kms) Can Pletis (1.366m). 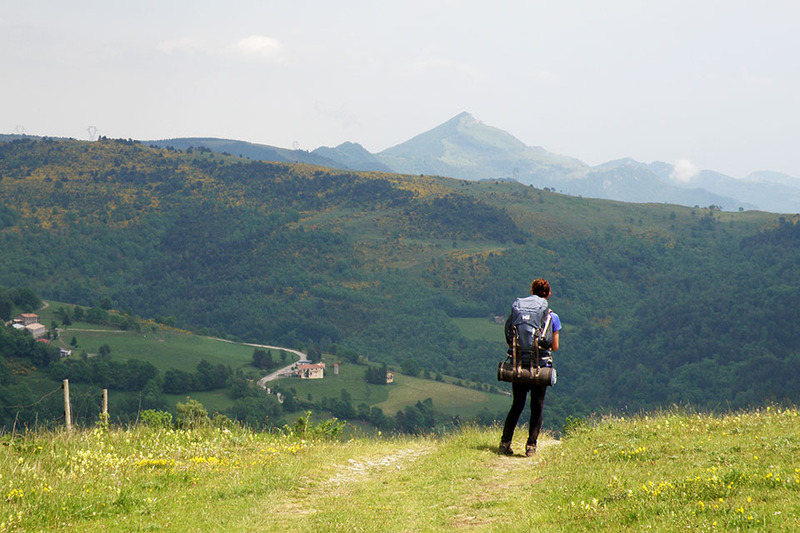 A track coming from Molló, which is suitable for motor vehicles, reaches this point. The surface of the track turns to cement, the first villas start to appear and you join a wider track. 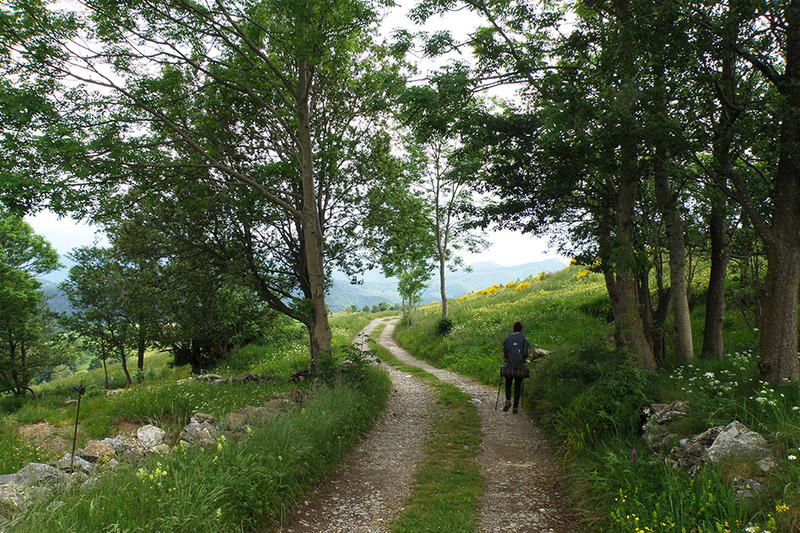 This track becomes a tarmac road and some yellow markings indicating the Camino de Santiago begin to appear. A wash house at the entrance to the village, with a drinking fountain (Font Vella) welcome you. 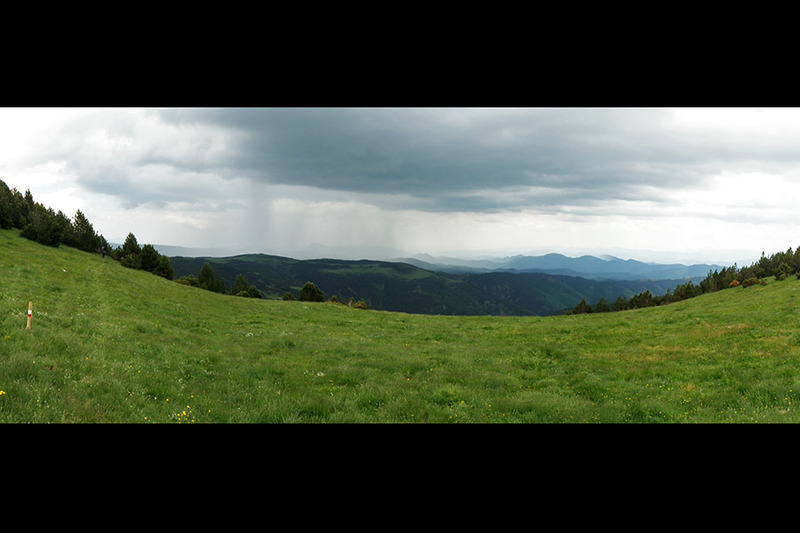 At the beginning of the stage, Refugio de Ulldeter (/). 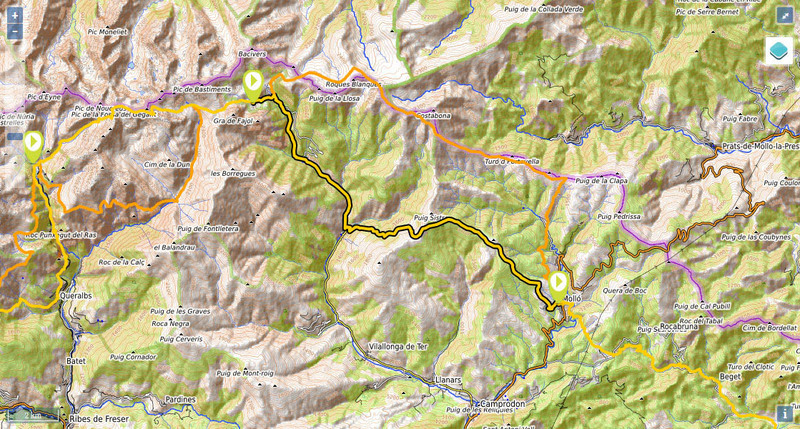 During the stage, in Setcases: Hotel La Coma , Hotel La Farga and Can Falera. 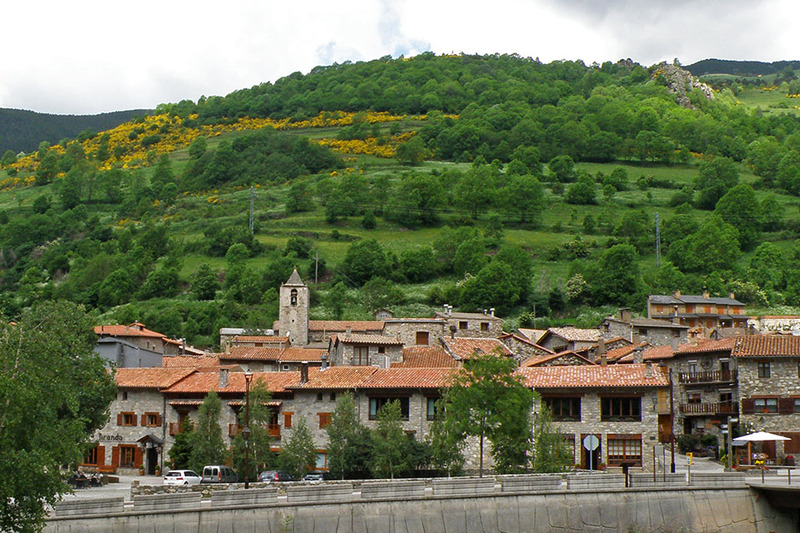 At the end of the stage, in Molló: Hotel Calitxo and Apartamentos Calitxo. Continuing on to the next stage (20'), Casa Rural La Costa has rooms for two people. In Setcases you will find "Ca La Nuria", a small store selling fruit, salami products, typical produce and a little bit of everything in general. There is no shortage of bars and restaurants. In Molló,in the square, you will find a small shop selling the basics and, on the way to the church, there is a butcher’s. This will be your last chance to do any shopping before Albanyà. You will also find the odd bar/restaurant. 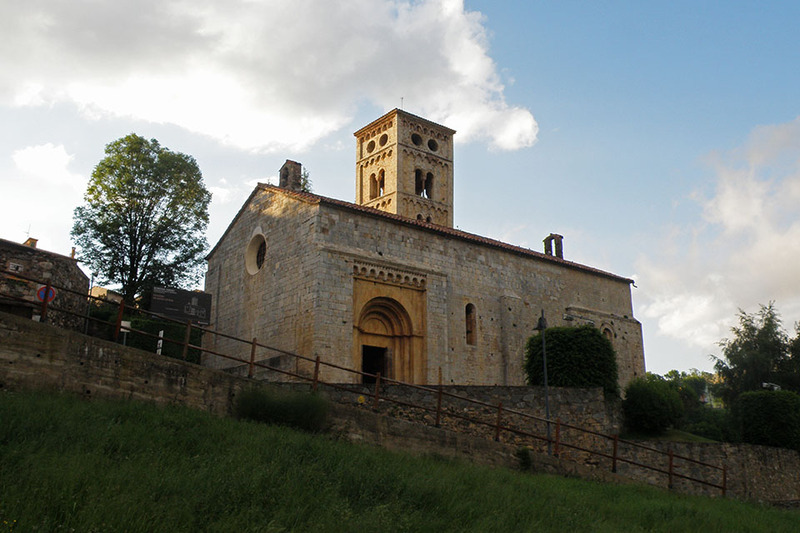 In Molló you can visit the Romanesque church of Santa Cecilia.